The ultimate end result of this was that I figured I might as well rewatch some other Bunker-heavy scenes and see how much I could fill out my sketches... and then because I had let on that I HAD sketches, a few people wanted me to share them... so, then I had to draw them out legibly. Warning: Large images beneath the cut, may not be good for small devices!! FYI: This doesn't include the Archive room, which we just saw in one of the S13 episodes that just aired. Also, also, and always, proportions my be slightly off - again, I'm not an architect, and these aren't official blueprints, I didn't estimate room sizes and scale everything accordingly or anything - I don't have that kind of time! The infirmery is only seen in 9x11, but it is DEFINITELY exactly where I put it according to that episode. The kitchen is also consistently always there and nowhere else. And yes, the Bunker really likes curved hallways. 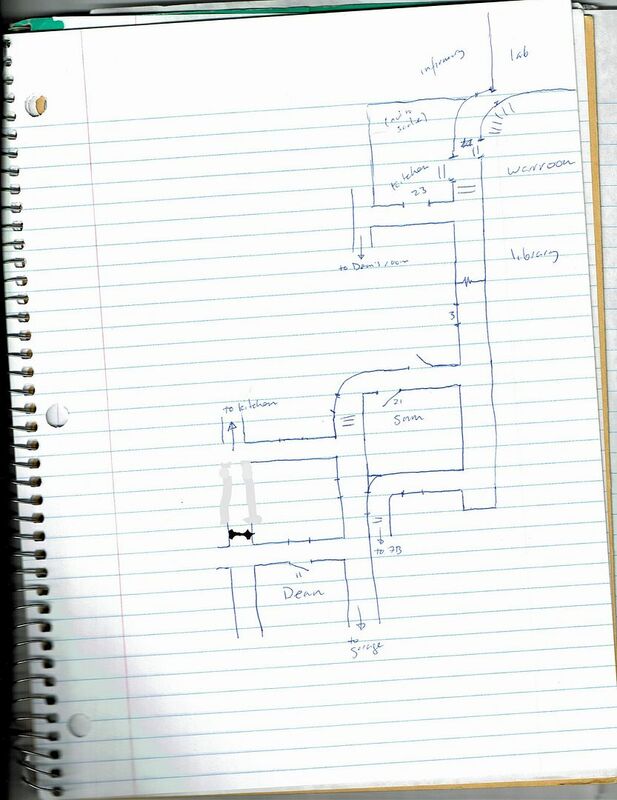 This entire "level" is based off the blue print that Dean consults in 12x22. 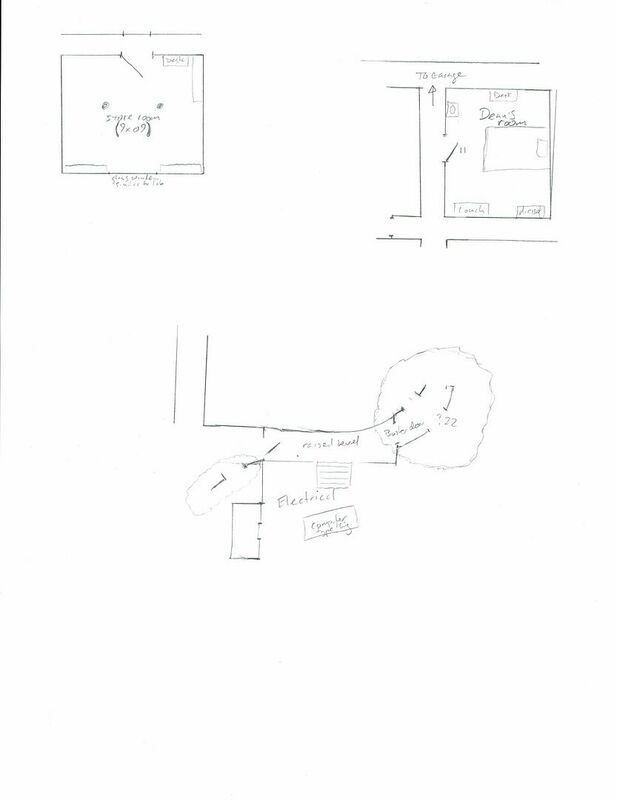 I just redrew it and added some things to make it more consistent with what we also see on the show (which was pretty much only adding the staircase that they use to enter the garage in the middle - which wasn't on the blueprint and dotting out the inclosed part of the garage that someone throws someone else into in 9x04). 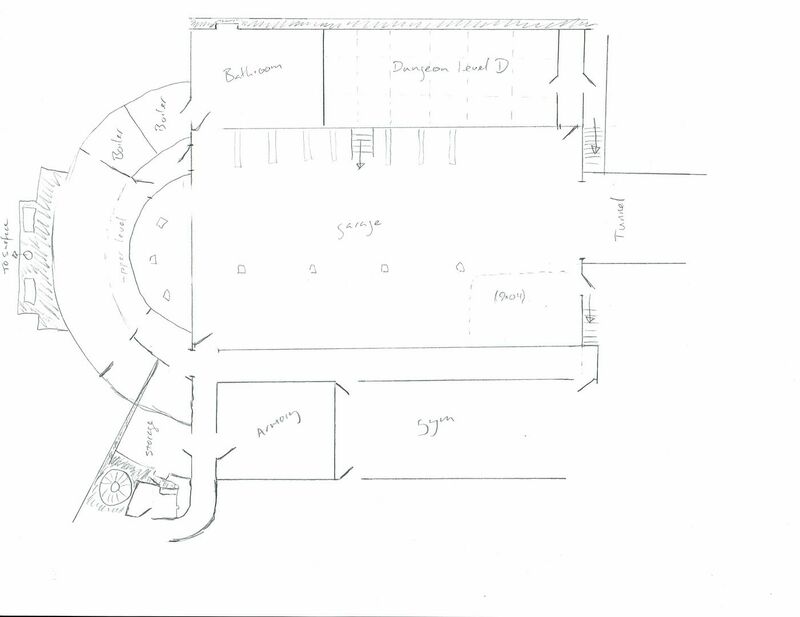 Also, of note is that hallway that curves past the armory - where does it go? Who knows! These are three disjointed rooms - we don't know where they lay in relation to anywhere else. We do know that they always approach 7b from that hallway on the right. We see a storeroom in 9x09 that has a similar layout (piller wise) as the Lab, but the blue glass window is on the other side and it has a completely different entrance. So, who the heck knows where that is! Dean's room is also floating fairly nebulously in space. But we know that Dorothy and Charlie doubleback to walk past it when they decide to go to the garage. And we also know that otherwise it is nearly surrounded by hallways. The Electrical room is VERY similar to the Computer room, and the reason it has fuzzy clouds around some parts is because 10x03 was very inconsistent in how the hallways outside of the room were shown. It appears to be a straight hallway when Dean walks in and busts down the door, but Sam is able to hide behind a curved piller and then flees through a curved wall when Dean busts down the door. Initially, I thought it had two entrances, and drew it as such, and then when I finished doing that on this nice version, I realized that that didn't make any sense because Sam LOCKS DEAN IN THERE, which means there's only one door. So, the curved hallway must be outside the same entrance as the straight wall. In 10x17, when Dean has a nightmare, we see Sam run down the curved hallway we see for every hallway-running-scene, regardless of where they are going... so, how do we make it work for where Dean's room is according to 9x04? A really weird relationship between Dean's room and the kitchen, that's what. Who knows how those hallways meet up, but they do. Also, I've got that hallway capped with a door on my other sketch of the hallways around Dean's room, but for the purposes of my guesswork, I left it open. 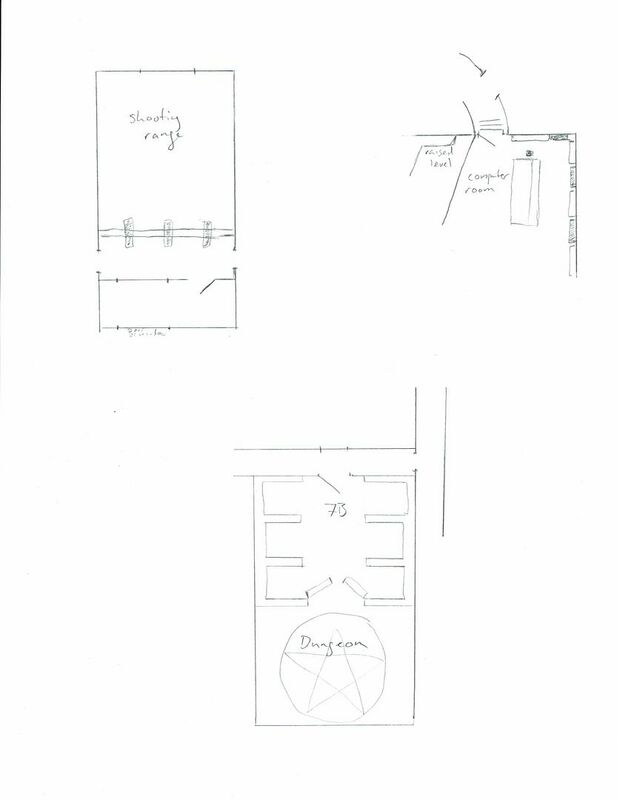 However, you could could still have it capped and have Dean have to go towards Sam's room, then back to the left in order to get into a position where he can get to that hallway outside the kitchen. I hope you enjoyed this tour of the Bunker as I understand it. Btw, while reading this I got to wondering about where room 32 is, which was Gabriel's room in 13x18. I read someone suspecting it was Sam's room, but I knew that wasn't it. Then I just remembered there was the room Mick slept in after drinking w/the boys in 12x17. I looked it up and that was room 5 and laid out very different from the other bedrooms - they all have the bed on the back wall and in Mick's room it was up against the left wall. I always assumed the garage was beneath everything else, but logistically would that make sense? Probably not because the garage would have to be fairly close to ground level for the Impala to drive into. I haven't looked at S13 episodes closely at all. But yeah, Gabriel's room was 32, Sam's is 21, so it's a different room. The only time Sam's given up his room was when Lucifer TOOK it in S11, otherwise, people tend to stay in room 15 (Cas, Mary), or, as you point out, Mick stayed in 5. To me, it makes more sense for the garage to be above everything else, as you say - and that they actually descend a fair distance when they enter the bunker main level. BUT, again, this was the discussion on twitter - the other fans thought that perhaps they were relatively on the same level, but the garage was completely underground with no surface powerplant on top of it, and that you got to it by walking past the bedrooms. It really all depends on how much surface area you think the bunker has. 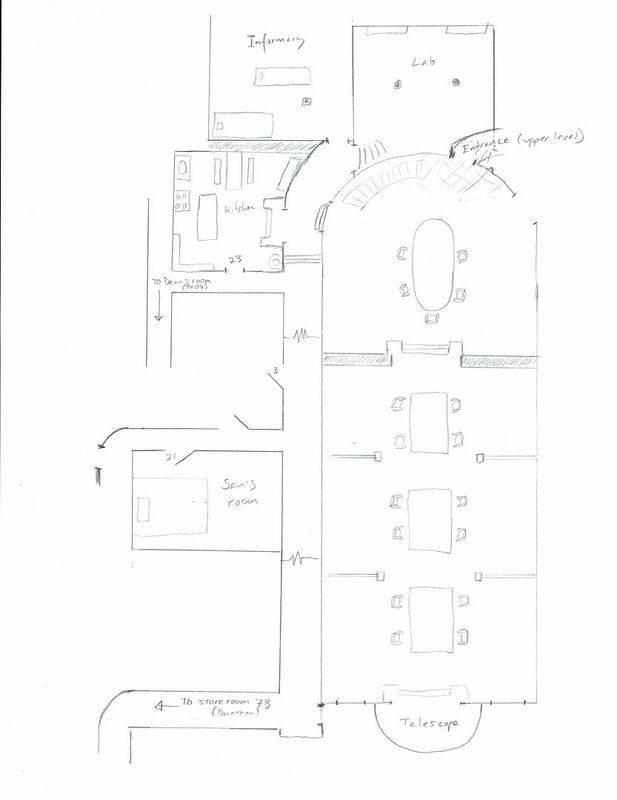 Another hypothesis is that the Bunker is actually magic, and folds in space... sort of like a combo of the Hogwarts and the Tardis, where you can have corridors move and shift, and more space inside than outside, etc. As usual, your attention to detail is amazing! Wow...that's impressive! I just figured "massive place" and would never have even tried to put things together. It seems like there should be a lot of spare rooms in there, somewhere. Back in the 40s, it looked like there were more people living there? Or staying overnight? Or do I have it all wrong? Thanks for putting that together! It's amazing. Yeah, there are tons of rooms. Just last episode, Gabriel was staying in room 32, so we know there are at least 32 rooms, and most of them are probably bedrooms. And it probably doesn't end there. Awesome :D My Christmas fic had Sam and Dean going up the stairs from the garage to the Library - I'd forgotten about There's No Place Like Home (title?) where they go up the stairs. Oh well LOL I guess I could re-write just that part for next Christmas. Slumber Party, I think is 9x04's title, where we first see the garage. I love your attention to detail-this is very cool! So the fic that started with our talk about John's service chain is now 8,000 words long and heading to the bunker. So I'm like, meh, now I need some bunker floor plans. Where should I look? And, lo, you come through for me again! Thank you! Oddly enough, you commented just after I'd finished piecing together screencaps of the garage level blueprint. I find it intriguing that there is a Main Corridor marked on the nearside we don't see much of. The fact that the main corridor is on this side suggests these are the rooms most often in use and that this corridor might be in the same place on each level. Maybe. It makes sense to me that the upper floor (I do think the living level is above) is on this nearside with the abundance of thick walls to support its weight (I think the garage area is much bigger than the war room/library and does not have much in way of support for it). But, on the other hand, why have your bathroom/boilers/water on the totally opposite side of the living/most used areas? Yeah, it's a real puzzle to put together. I went back and looked at my own screencaps just now, and I realize that I have the garage level slightly off on the side with the armory and gym, because it was hard to see under Dean's arms. But, oh well, hopefully, like you - anyone who is doing deeper investigations will look up the episode too and double-check my work. One idea we floated on twitter was that the Bunker was magic and changed shape - and that you had to have intent when exploring in order to find what you were looking for. I mean, that's a sort of ridiculous notion, but it also delights me in some way, because they have magic internet, and magic warning systems, but they still need boilers for hot water. As for the bathroom, I always just saw that as a the bathroom for anyone working in the garage area - so, not the bathroom you would use if you woke up in the middle of the night - but maybe the bathroom you would use if you were working on the cars, or using the gym, or trying to figure out why the boiler wasn't working. Yeah, I think we are trying to apply logic where it doesn't belong! Nothing about the bunker actually makes sense. It gets free water and power because it's built under a hydro power plant? Because no one from the water/power board would say hang on! Where's that water/power going? And no townsfolk would write to complain about getting high bills when they are right next to a power station that's definitely on because they can see/hear it. Which reminds me, surely living under a power station must be hot and noisy? Yup, it must be magic! And it was pure murder so remind me not to do that again! Came across this while compiling a visual guide to the bunker--very glad I did, as this is a great resource. Thanks for sharing it! Ooo! Sounds like a great project! I'm glad I could help out with it!